Detroit-born playwright Dominique Morisseau has crafted a script that keenly charts the escalating racial violence in a small-town Louisiana High School after a group of white kids hang nooses from a tree on school grounds. Inspired (and therefore containing some poetic license) by this true event, Blood At The Root is both a fascinating, and disturbing commentary on racism, the modern face of segregation and the psychology of racial hatred, the ‘root’ of the problem itself. The narrative takes place over a period of weeks as events begin with Raylyn, a young, black girl who decides ‘it’s just time’ to run for class president. Following this announcement, she and other black students sit in a ‘white’ area under a tree only to find nooses hanging there the following morning. Trying to brush off this act as an ‘adolescent prank’ only fan the flames, and finally six young black students are arrested for the ‘attempted murder’ of a white student. Stori Ayers, Allison Scarlet Jaye, Brandon Carter, Christian Thompson, Kenzie Ross and Tyler Reilly are all fearsomely talented young actors and work insanely well as a super tight ensemble. Their deliveries are keenly choreographed, in-your-face and pulsating with emotion. The simple set comprised a black outlined painted tree and a group of chairs used cleverly to define movements in place throughout the story. The performance features hip hop, rap and mime sequences that confirm and convey the oppressive nature of racism and its social/psychological effects, implications and finally, ramifications. If you see nothing else at the Fringe in 2015, you won’t be sorry you saw this. Blood At The Root continues at Holden Street Theatres – The Studio until Sun Mar 15. 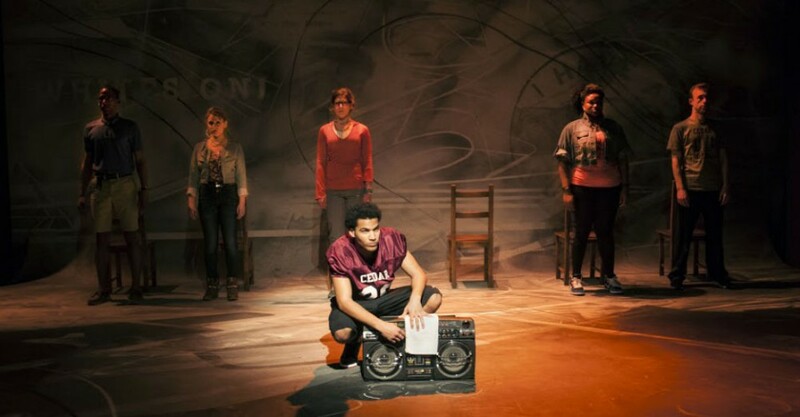 Holden Street Theatres – The Studio, Sat Feb 14 Detroit-born playwright Dominique Morisseau has crafted a script that keenly charts the escalating racial violence in a small-town Louisiana High School after a group of white kids hang nooses from a tree on school grounds. Inspired (and therefore containing some poetic license) by this true event, Blood At The Root is both a fascinating, and disturbing commentary on racism, the modern face of segregation and the psychology of racial hatred, the ‘root’ of the problem itself. The narrative takes place over a period of weeks as events begin with Raylyn, a young, black girl who decides ‘it’s just time’ to run for class president. Following this announcement, she and other black students sit in a ‘white’ area under a tree only to find nooses hanging there the following morning. Trying to brush off this act as an ‘adolescent prank’ only fan the flames, and finally six young black students are arrested for the ‘attempted murder’ of a white student. Stori Ayers, Allison Scarlet Jaye, Brandon Carter, Christian Thompson, Kenzie Ross and Tyler Reilly are all fearsomely talented young actors and work insanely well as a super tight ensemble. Their deliveries are keenly choreographed, in-your-face and pulsating with emotion. The simple set comprised a black outlined painted tree and a group of chairs used cleverly to define movements in place throughout the story. The performance features hip hop, rap and mime sequences that confirm and convey the oppressive nature of racism and its social/psychological effects, implications and finally, ramifications. If you see nothing else at the Fringe in 2015, you won’t be sorry you saw this. Rosie van Heerde Blood At The Root continues at Holden Street Theatres - The Studio until Sun Mar 15. Book at FringeTIX on 1300 261 255 or adelaidefringe.com.au/fringetix. Click HERE to purchase your tickets.